The holiday season is a time for giving. Many Americans get in the holiday spirit by donating their time, money or resources. To celebrate all who donate, we analyzed Google search trends to determine which states give back the most. We chose four popular search terms that indicate interest in donating time or money—“best charities to donate to,” “places to donate near me,” “volunteer opportunities near me,” and “what percentage of income should be donated to charity”—then calculated search volume for those terms, per capita. 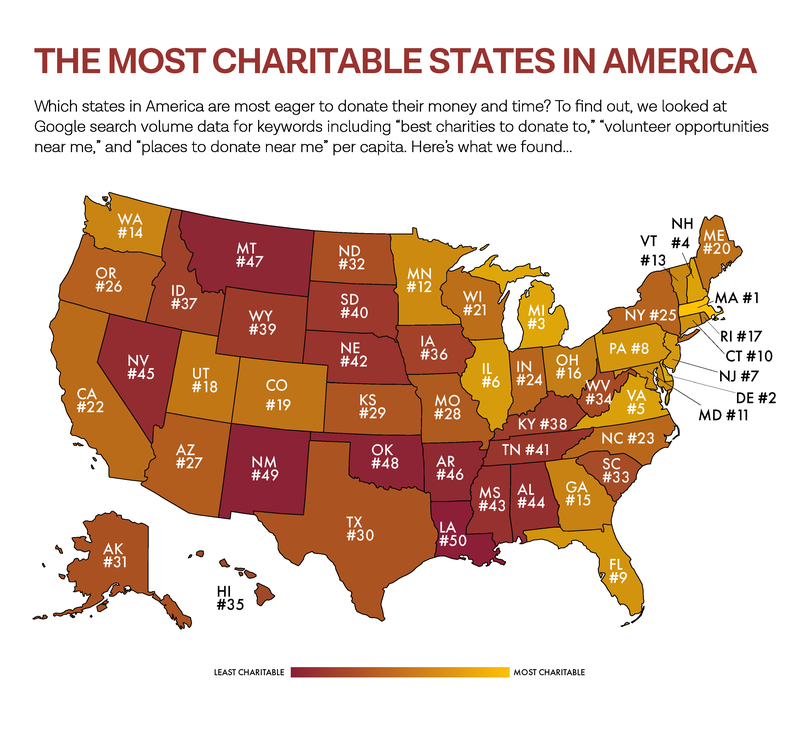 So, which states are the most charitable? Massachusetts claimed the top spot, according to our analysis of Google search trends data. Not far behind, Delaware, Michigan, New Hampshire and Virginia rounded out the top five most charitable states in the country. Finishing out the top 10 were Illinois, New Jersey, Pennsylvania, Florida and Connecticut. Looking at the top 10 list, it’s not surprising that most of the states who give back were from the East Coast. Maryland, Vermont, Rhode Island and Maine came in at No. 11, 13, 17 and 20, respectively. The Midwest makes an appearance with Minnesota and Ohio who came in at No. 12 and No. 16. The top 20 is rounded out by Washington at No. 14, Georgia at No. 15, Utah at No. 18 and Colorado at No. 19. States from the South and Southwest closed off the bottom of the list. Coming in at No. 50 is Louisiana, with New Mexico, Oklahoma, Montana and Arkansas making up the bottom five. Some other states who could stand to donate some spare change: Nevada, which ranked at No. 45 and was preceded by Alabama, Mississippi, Nebraska and Tennessee. The states who landed in the middle need to step their donation game up a bit, but thankfully, made it out of the very bottom. Wisconsin just missed the top 20, followed by California at 22, North Carolina at 23, Indiana at 24, New York at 25, Oregon at 26, Arizona at 27, Missouri at 28, Kansas at 29, Texas at 30, Alaska at 31, North Dakota at 32, South Carolina at 33, West Virginia at 34, Hawaii at 35, Iowa at 36, Idaho at 37, Kentucky at 38, Wyoming at 39 and finally, South Dakota at 40. Based on search volume data for the following keywords: best charities to donate to, best nonprofits to donate to, places to donate near me, volunteer opportunities near me, what percentage of my income should be donated to charity.